Canada's most northern society-driven above-the-tree-line greenhouse! 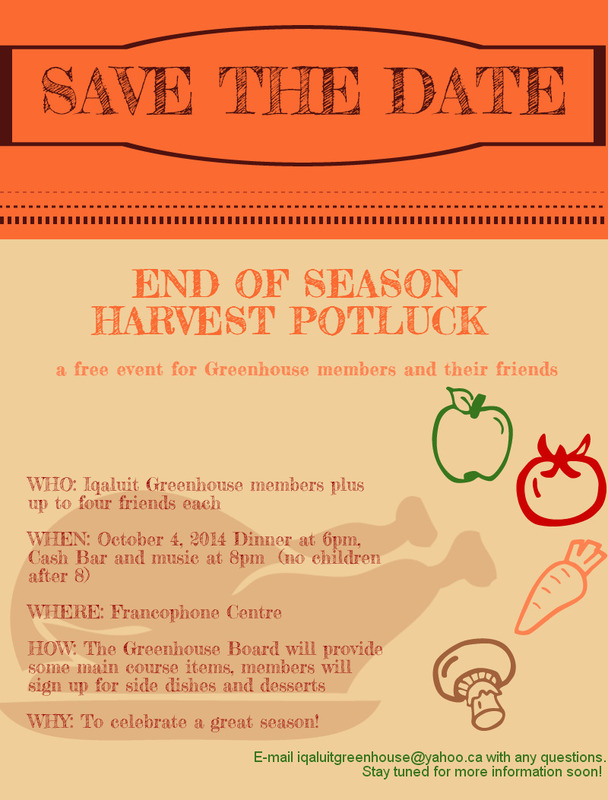 SAVE THE DATE for our End of Season harvest Potluck, Saturday October 4 at 6pm! This event is for greenhouse members and their friends to share a fall meal and to celebrate our successes as a community greenhouse. Please RSVP on our doodle page with how many guests you will be bringing (max of 4) and what dish you will bring. Nobody wants 20 hummous dishes!! The event will be family friendly until 8, and 19 + with a cash bar after. Do you have any photos from the greenhouse this year? Please email them to us at iqaluitgreenhouse@yahoo.ca, and we’ll include them in our photo slideshow!